Two rivers, 13 miles of paddling including a 5 miles of Heritage Water trail commemorating 28 sites of riverfront history through the village of Union City, Michigan. The 500+ acre Union Lake is an all sports lake with a DNR public boat launch off of Tuttle Rd. on the north side. This trail offers several points to carry in and launch canoes, kayaks and tubes. DNR Boat Launch of Tuttle Rd., Sherwood, MI. for access to Union Lake. An all sports and good fishing 500+ acre backwater to Riley Dam on the St. Joe River. St. Joe River: bass fishing and other species. Union Lake: Excellent for bass fishing, bluegill an catfish. Other species include carp, pike and walleye. Thirteen plus miles of water for kayakers and canoers. The upper part from Riverbend Park on Girard Rd to the Palmer launch can be challenging with swift current and deadfall and should only be considered by strong advanced paddlers looking for adventure. A few hundred yards after you make the turn from the quick running Coldwater River into the St. Joe on the south (right) bank you will note a house balcony overhanging the river. This is the home of the Smith family owners of a longtime local watering hole, known as "The Bucket" and historical marker #8. There is a dock here and paddlers are welcome to pull up, venture through the gate to the bucket for a burger an a cold beer. Manager Tony Smith, grandson to the original owner promises to add ice to your cooler if you pick up beverages from him. You can also park here and access the river if you like. If you pull out at Historical Marker #16, Riverview Park, just past the Broadway Bridge on the left it is a 5 min walk to the north over the Broadway bridge to several dining establishments which include: Five Star Pizza (dine in or take out); Daily Grind (espresso, breakfast, lunch and pastries); McGhees Pub (food and bar); Broadway Bar and Grille (craft brews on tap, extensive menu); Mel's 60 Diner (classic small town diner). As you exit the Heritage Water Trail at Riley Dam you will hear the hum of generators an roar of water as this nearly 100 year old dam still produces up to 15% of village electricity. The wetlands near Arbogast bridge (west of the Village of Union City where the St. Joseph spreads to become Union Lake) provides important habitat to many birds an waterfowl, including egrets, sandhill cranes, geese, swans, and ducks. Eagle an osprey are often seen over Union Lake. Historical marker #16, Riverview Park offers full park facilities, picnic shelter & tables, portajohn, basketball and playground equipment May though early November. Any where along these waterways you may find deer, beaver, muskrats, turtles, waterfowl and other wildlife. Eagles are often seen over this area as well. This trail includes approximately 13 miles of paddling that includes a Heritage Water trail commemorating 28 sites of riverfront history through the village of Union City, Michigan. The first stretch above Union City on the Coldwater River starting at Riverbend park to JP Palmer Launch as of 7/20/2016 is reportedly fairly open now as far as deadfall. Several folks have been working to clear this stretch. If the water is running high from rain, snow melt etc. the Coldwater River from Riverbend Park to the JP Palmer launch to Union City should be given a bit of respect as the current can run pretty quickly with obstacles to maneuver around. An easier stretch is the 5 miles though the Village of Union City starting at the JP Palmer Launch and extending across Union Lake to Riley Dam. This stretch known as the Union City Heritage Water Trail was launched during the village's 2016 Sesquicentennial Celebration with nearly 200 kayakers, canoeists, and tubers made the inaugural float. Starting at the JP Palmer launch, you will experience the challenge of a bit a bit of quick current on the final 700 yards of the Coldwater River before you make the turn onto the lazier, deeper St. Joe. Paddle past 28 historic markers complete with vintage photos and history including an island created when an iron bridge dropped into swirling flood waters in the Great 1908 flood and the remains of the Elkhorn lodge, home to Union City's own Daniel Boone like legend, Skinny Bullock (for complete details: www.uchwt.com) Near the Arbogast bridge you will find a wetlands where many bird and waterfowl species can often be sighted. Passing under Arbogast bridge you can choose then to paddle on across Union Lake approximately 2 miles to the DNR launch at Tuttle Rd. or 3 miles to Riley Dam and the final marker on the Heritage Trail. Beware this is a long lake paddle to the west an can be challenging on a windy day. An ADA portage was finally placed around the dam that had been blocking the river for nearly 100 years in 2016. The bright orange buoy line can be seen fairly far down the lake after crossing under Arbogast bridge. The portage is on the right side of the dam. You can end your trip here or re access the St. Joe in a natural streamside access and continue on down the St. Joe to the Athens Rd. Bridge or the Arney Rd. Bridge. amidst a woodsy remote feeling section of the river, and possibly encounter an occasional deadfall. This section is a a long time favorite local float. Note, no section of the trail is maintained by any livery service and there is currently none servicing the area. Local paddlers work to keep the river open. The 5 mile Heritage water trail in the center of this trail from the Palmer Launch in the southeast corner of the village to the Riley dam tends to be the most open stretch of river. River access, parking, restaurant and beverages. Mural map of the Union City Heritage Water Trail under the Park St. Bridge completed June 16 by two local artists. Land at Riverview Park and 5 minute walk to north over the Broadway Bridge for food and drink. Portage around Riley Dam at southwest end of Union Lake. Occasional Deadfall in this stretch. 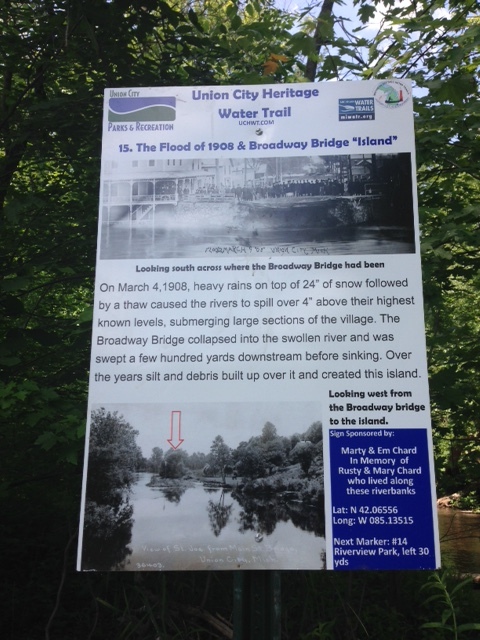 The 5 mile stretch through the village starting at the JP Palmer Launch is Heritage water trail containing 28 markers with vintage photos and text.